PAX, The Performing Arts Exchange in Miami, is a tucked away world of cultural expression right in downtown. Underneath I-95, this is a true underground hide-away that glows with good vibes and consciousness. In the words of its founders, PAX is dedicated to “fostering cultural diversity through the arts in hopes of human progress in a culture of peace.” And that it seems to do. As a tango dancer and having recently returned from living for many years in Buenos Aires, I went with a friend to hear Tango Conspiracy and take a turn or two on the dance floor. Lead by composer, producer, musician, and singer Jimena Fama, the band fuses classical tango with an electronic dub sound. 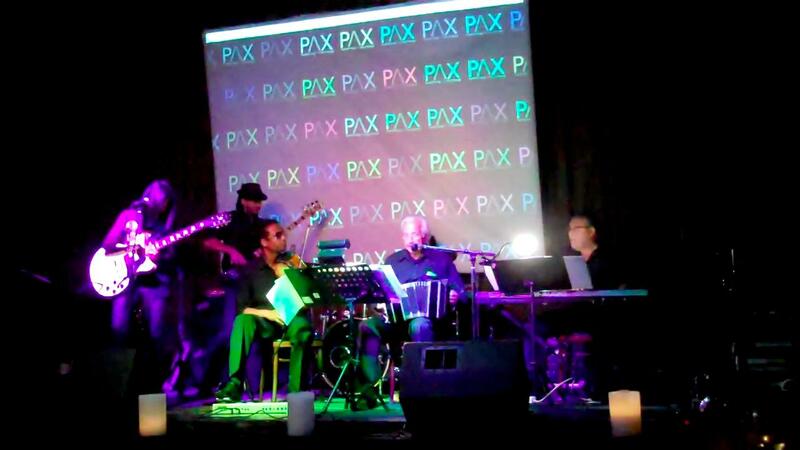 With the roots of tango always in the forefront, Tango Conspiracy consists of guitar, bass, bandoneon, violin, drums, and a VJ to create music that moves the strict classicists as well as the tango evolutionists who thrive on the forward movement of the scene. In a dark, lush, friendly environment, we took to the floor, dancing to variations of Astor Piazzolla and other tango composers, as well as the original music that drove the dancers to greater creation. Dancers Diego Santana and Maria Pia Sanz gave a very nice exhibition, their bodies twining around the rhythms, sinewy and expressive. I had danced a little with Diego at a Milonga* the week before and loved the ease with which he partners, and the generous way in which he allows the woman to express herself in the dance. Watching him with his partner, I felt like I was back in Buenos Aires, at the Milonga, La Cathedral, where the certain decadence and poetry of the space gives back an aura so conducive to the Tango. PAX has a lot of interesting programming that goes on throughout the week. There’s a Jazz series on Wednesdays, a singer/songwriter series once a month, an open content series where different musical genres happen side by side, and other evenings of Brazilian and Afro-Cuban bands playing to the bodies on the dance floor. It’s a great scene where you can dance to what you love, listen to great musicians, have a good Mojito or anything else from the bar, and flirt with a different kind of Miami nightlife. Tango Conspiracy has produced several interesting CDs, usually marriages between tango and other genres, such as boss nova. The feel is great and the musicians are excellent. *Milonga is the name of the social event for tango dancing.